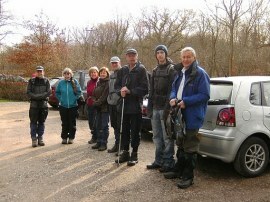 We did this walk on Sunday 27th February. I had an easy drive down to Lye Green where I met up with the others before heading over to Minepit wood for the start of the walk. The weather forecast I had seen was quite good and the day started reasonably bright although towards the end of the walk we got caught in a patch of drizzle, the third Sunday in a row I have ended getting wet! 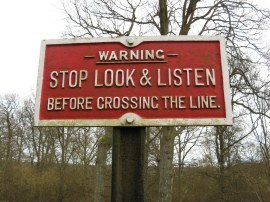 (2) Stop Look & Listen, always good advice! 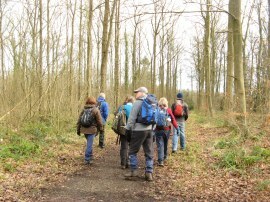 For the first time in ages we had a full set of walkers and nine of us set off from the car park off Vowels Lane as we made our way through Minepit Wood to the point we had finished the last stage of the High Weald Landscape Trail a few weeks earlier, photo 1. Having rejoined the route it was only a short distance through the trees before we reached a minor road where there was a convenient layby we could have parked in, if only we had known about it. Turning to the right we followed the lane round to a rail bridge over the road which a few of us headed through towards the buildings of Mill Place but fortunately Sara who had a map, and more importantly was paying attention, soon called us back and onto the right path which actually joined a footpath on the right just before the bridge was reached. 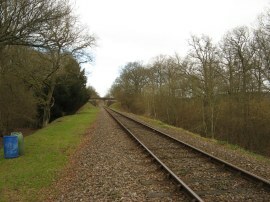 This path runs through trees running parallel to the rail lines before bending to the left and heading up a flight of wooden steps to cross over the railways lines, photo 3, which are part of the Bluebell Railway. Once over the railway lines the path heads through a small area of trees before heading through a field to reach a small wooden footbridge over the River Medway, photo 4. 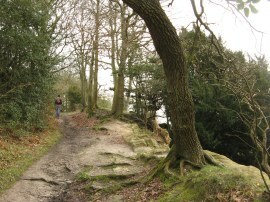 The route then heads uphill to join a section of path running along the top of a small rocky outcrop, photo 5. 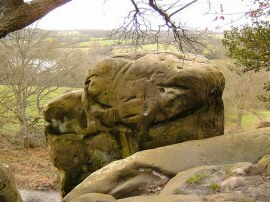 The area of sandstone, known as Stone Farm Rocks, is popular with climbers and many of the boulders had deep grooves worn in them from the climbing ropes, photo 6. 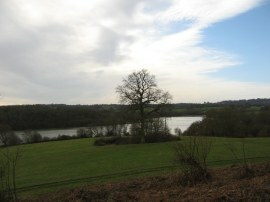 Away to the right the Weir Wood Reservoir could be seen as we made our way along the path to join West Hoathly Road. At the road the route heads to the right for a short distance before joining a track on the left. This is the remains of an old road that once continued across the Medway valley before the 280 acre reservoir was created in 1953. Just before the track reaches the waters edge the route joins another track on the left that runs just inland from the edge of the reservoir before joining a footpath on the left that heads up a field edge towards a patch of trees with good views developing back across the water, photo 7, as the path heads uphill. 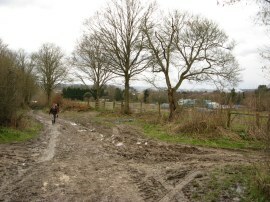 The path continues on alongside fields before joining the driveway to Standen House which is followed to the left up to rejoin West Hoathly Road. 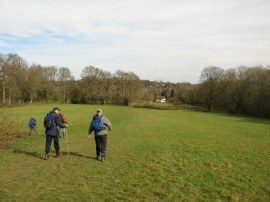 Here the High Weald Landscape Trail heads to the left for a short distance before joining a footpath on the right that runs along the right hand edge of some rugby pitches. Before the end of the playing fields the route then joins a footpath on the right which heads across fields, photo 8, for a while with a patch of woodland to the left to eventually meet Medway Drive which is followed down to Coombe Hill Road. 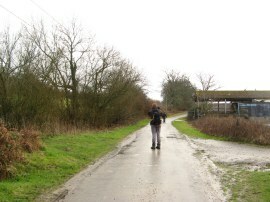 Here the route heads to the right down to a T junction where the West Hoathly Road is joined for a third and final time before the path soon heads away to the left along a footpath that runs round the back of a pub car park and an factory building before joining another field edge path that heads up towards the outskirts of East Grinstead. As the path continues ahead it passes by some houses on the right and heads by an large enclosure of ducks and chickens before reaching the B2110 Turners Hill Road. Here the route heads to the right, continuing ahead at a small roundabout into West Hill which is followed into West Street, the path all the while heading steadily uphill through East Grinstead. Reaching the top of the hill we continued ahead along the High Street where there were a number of fine old buildings, photo 9, and on into the Lewes Road. 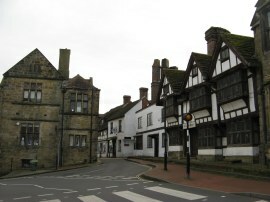 I had never been to East Grinstead before and it definitely seemed a place that would be worth a visit sometime. 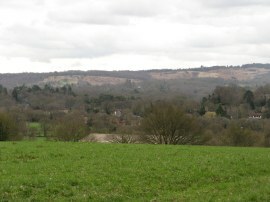 Reaching the junction with the A22, where Maria left us for the day, the High Weald Landscape Trail joins a tarmac track on the right that heads down to the join the course of the Forest Way which runs along the track of an old railway that used to run between Three Bridges and Tunbridge Wells, photo 10. The route is now part of the Sustrans National Cycle Network and provided easy walking along a level and reasonably well drained surface. 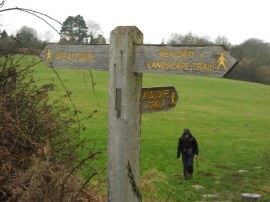 The High Weald Landscape trail follows the Forest Way for just over two and half miles as far as Forest Row and on route we stopped for our lunch break at a handy picnic table besides the path. Approaching the outskirts of Forest Row the route crosses over the busy A22 before continuing ahead along a lane that leads up to Tablehurst Farm. 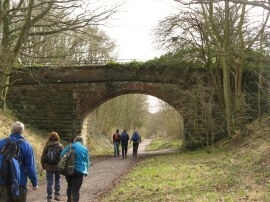 Just before the farm buildings are reached we crossed over the route of the Vanguard Way which we had walked as a group some 15 months earlier. The path then leaves the Forest Way, bearing to the left through the farm buildings, were there was an enclosure of pigs all happily sleeping on their beds of straw, before heading to the left uphill along a farm track, photo 11. 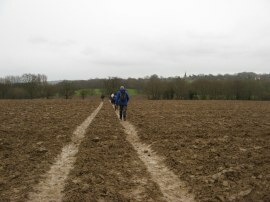 The route follows the track round the right and then left as it heads up to reach a field edge path. Looking back the way we had walked there were good views to the South over Ashdown Forest, photo 12. And across to our right we could make out the route of the Vanguard Way heading over the other side of the fields, photo 13. 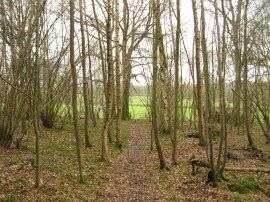 The path then heads along a number of field edge paths, and through a small steep uphill section of woodland, as it makes it way to Cansiron Lane. On the way we passed a large fenced enclosure in one of the fields although we could not see any signs of life on the other side and we were unsure exactly what it might be for. At Cansiron Lane the High Weald Landscape Trail heads to the right and where the lane heads sharp left joins a footpath that heads diagonally to the left across the middle of a field, photo 14. Although it is hard to tell from the photo, the surface of the field, like many we had crossed during the walk, was completely waterlogged and we had all spread out to try and find a less damp route across the grass. This was a very rural part of the walk, the path crossing another large open field before heading down to reach a patch of woodland. The route continues ahead along a broad path through Paupersdale Wood before joining another field edge footpath with trees to the left. Having headed besides a couple of more fields the route reaches a small pond by a camp site at St Ives Farm West. Here we went slightly off course once again, following a track round to the right through the camp site which led to a locked gate when the actual route of the footpath continued diagonally to the right across a field. 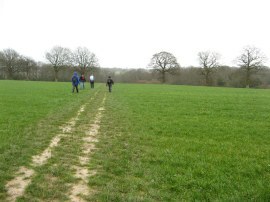 This field however had been deeply ploughed and the right of way had not yet been reinstated and we all decided it would be far to muddy to attempt to cross so instead we followed a farm track that ran round the edge of the field instead which eventually led to the point where the correct route would have exited the field. We then joined a footpath on the right that headed into the fields through a tall metal deer fence. The path heads across a couple of fields towards a small patch of woodland, photo 15, where I stopped to put on my waterproof jacket as the drizzle that had started earlier was starting to get a bit too heavy for my fleece. Leaving the trees the path heads along another field edge before heading diagonally across another ploughed field although fortunately on this occasion there was a clear path, photo 16, made across the field which was much appreciated. This path was followed down to a wooden footbridge where we once again crossed over the River Medway, photo 17, and on the opposite bank Tommy found a geocache in the hollow trunk of a tree which he and Dave duly signed. Just a few yards up the path from the river the route crosses over the Forest Way and then continues ahead alongside a couple of fields and a playing field to reach the village of Hartfield, photo 18; as so often the attractive houses somewhat obscured by parked cars. 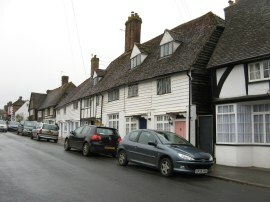 Hartfield was the home of A.A. Milne, author of the Winnie the Pooh books, from where many of his books are set. 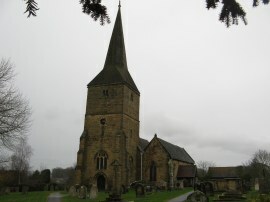 The High Weald Landscape Trail briefly visits the village, heading to the right along the High Street for a few yards before then turning left up Church Street, passing the church of St Mary the Virgin, Hartfield, photo 19. Reaching the end of the lane the route soon heads back out across fields. 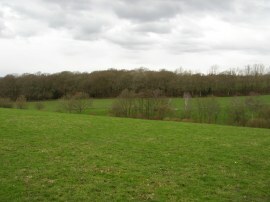 After heading diagonally across a couple of fields, photo 20, the route heads round to the right by Forstal Farm before heading to the left through a small patch of woodland. 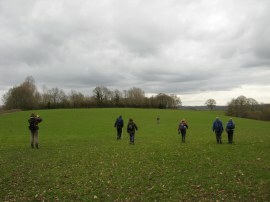 The route then heads up across the middle of another field to reach a minor road where the High Weald Landscape Trail briefly links up with the Wealdway, photo 21, on the outskirts of Withyham. Here the route heads to the left before joining a track that bears to the right which soon leads down to the B2110 Withyham Road. 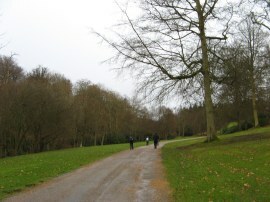 This is followed to the right before the route heads to the right by the Dorset Arms along a driveway running through the grounds of the Buckhurst Estate. The Buckhurst Estate has been owned by the Sackville family for some 900 years and the house, Buckhurst Park, is still their family home. The surfaced driveway, photo 22, made for some easier walking as we made our way through the grounds and the rain also finally stopped. 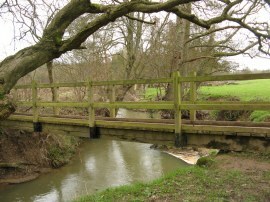 Inspired by our earlier visit to Hartfield we stopped for a quick game of Pooh Sticks at a bridge over a small stream before continuing through the grounds to join a track running along the edge of an area of woodland. Leaving the trees the route heads to the right, climbing gently uphill along the edge of a field, photo 23, as the sun tried to break through the low clouds. Once over the brow of the hill the route descends downhill, skirting round the edge of some gardens and passing through a small patch of trees to reach Lye Green Road. Here the route continues straight ahead down Whitehouse Lane, photo 24, were we finished this stage of our walk along the High Weald Landscape Trail at the point where the route leaves the road opposite Whithouse Farm. From there it was just a short walk further along the road back to our parking place. Back at the cars we had walked a total distance of 16.5 miles of which about 15.8 had been along the High Weald Landscape Trail itself. 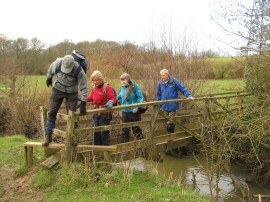 Despite the damp weather during the afternoon this had been another enjoyable walk with pleasant company through nice countryside. 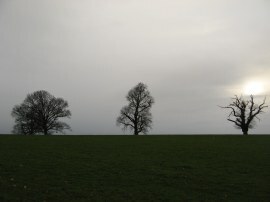 Below are a few photo's that Sara took during the walk which feature yours truely. 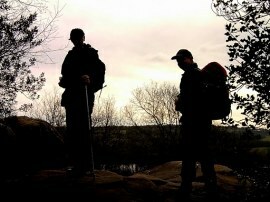 I have uploaded the route of the walk which can be accessed here HWLT stage 3 Route.